We had an interesting wine from Fairview in Paarl, South Africa, to dinner. No, not just interesting, but a very good one. Perfect to the grilled lamb with its spicy side dishes. The interesting was the mix of Pinotage and Viognier, where the latter brought a gentle but delicious floral aroma to the wine. 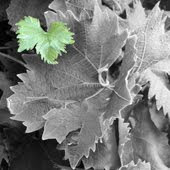 The practice of adding the white Viognier to a red wine originates from northern Rhône. 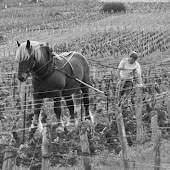 In Côte-Rôtie it is allowed to add up to 20 percent of Viogner to the Syrah. The usual practice is much lower, about 2 – 5 percent. When Viogner and Syrah co-ferments, the wine gets a nice aroma and the colour is stabilised. I already knew Fairview’s beautiful pure Viognier. Round but surprisingly fresh, with lovely floral aromas. 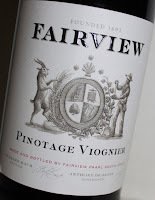 Fairview was back in 1997 the first producer in South Africa to make a Viognier. The grapes get a long period to get the right ripeness and the yield is very low. Fermented in a combination of French oak and stainless steel and left on the lees for ten months. A wonderful wine, and to the delight of us consumers, very reasonable priced. Also a good choice for spicy food. 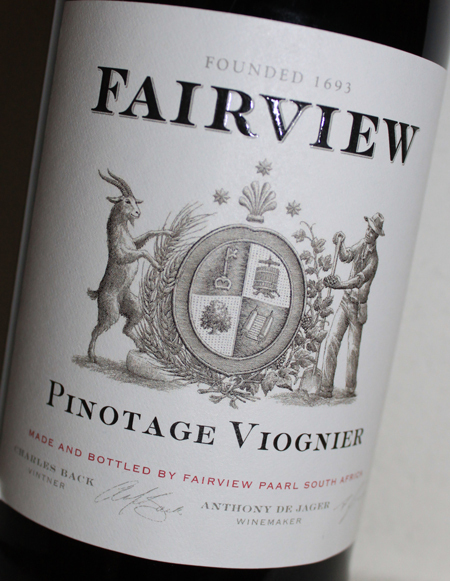 The innovative Fairview has once again come up with something new in the Pinotage Viognier blend. And once again they have succeeded. Just as in Rhône, the winemaker Anthony de Jager has made a co-fermentation. Now the black Pinotage grapes together with a small percentage of Viogner. Then nine months in old French and American oak barrels. The result, a softer Pinotage with marked fruit. My tasting notes says; Soft aroma with dark berries and some floral hints. Medium bodied, marked but soft tannins, nice medium acidity. Dark fruit with morello cherries, beautiful floral hints. Just a very tiny sweetness and subtle oak. Good length. New world wine in old world style. A truly good wine, easy to drink and great to food. 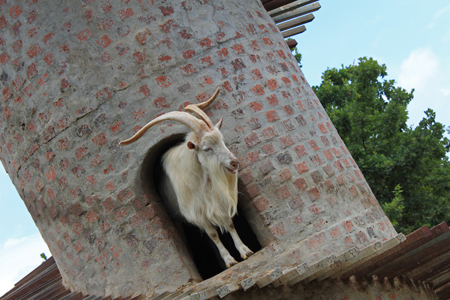 Fairview is well-known not only by the wines labelled Fairview, but, perhaps even more, for the Goats do Roam selection of wines. Also a range of really good wines, humorously branded with allusions to the goats lodged at Fairview’s estate; Goat-Roti, Goats do Roam in Villages, Bored Doe, etc. And the goat cheese, just wonderful! Chianti Classico - new classification for whom? How do you like your Riesling?